Are you interested in the creative field of styling and visual merchandising? Take FASHI1620-001 Visual Merchandising, for 16 weeks, starting Jan 27th. The class meets on Fridays from 9am-1:50PM at the College of DuPage Fashion Studies department. Sharpen your skills with hands on experience planning window and interior display space. Work with signage and lighting in the College’s large window display lab. For more information, contact Sharon Scalise, Program Coordinator at scalise@cod.edu. Check out Vin Reed’s design work! Vin is the instructor for Fashion Stylist, Digital Fashion Illustration and Visual Merchandising. 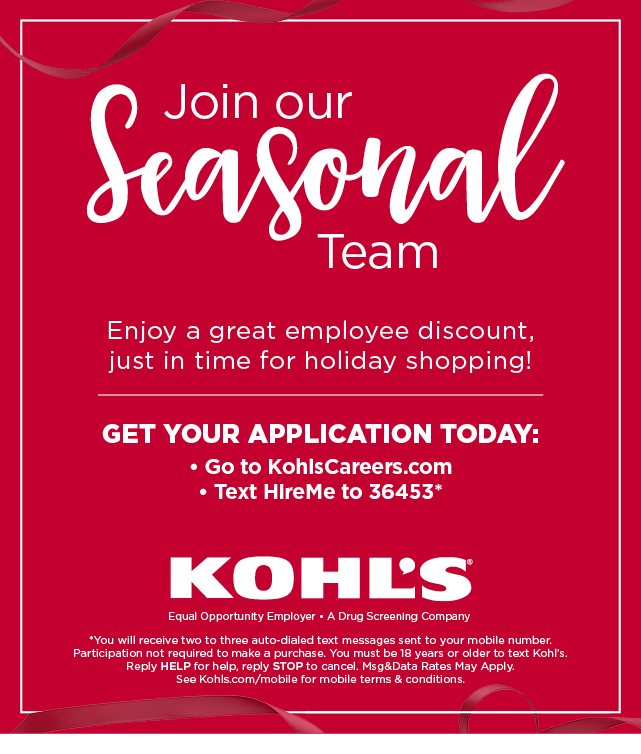 Kohl’s is Hiring for the HOLIDAYS! Apply now to be a part of our seasonal team. | View this email in a browser. If any merchandise featured above indicates “Offers and coupons do not apply,*” the merchandise is not eligible for promotional offers and coupons. However, you are able to earn and redeem Kohl’s Cash® and Yes2You Rewards® on this product. Visit Kohls.com/exclusions or see associate for details. Do you love fashion? BCBG MAXAZRIA is hiring stylists! This is just the place for you! Fill out an application and join the team today! We are currently seeking top talent at the Chicago Premium Outlet Mall in Aurora, IL. We are seeking part-time Sales Associates who have a passion for luxury retail fashion. This person must have great customer service skills and understands the art of selling. This person must able to work closing shifts on weekdays and work weekends. This is a fast-pace environment full of upbeat energy. Please email a resume along with references and a short paragraph within the email body, stating why we should hire you. Fashion historian Laurent Cotta tells us about “power dressing” in Paris in the 1800s while exploring an exhibition first staged at the Palais Galliera in Paris and now opening at the Fashion Institute of Technology in New York. Élisabeth de Caraman-Chimay, the Countess Greffulhe (1860—1952), was a famous beauty celebrated for her “aristocratic and artistic elegance,” and the inspiration for the character Oriane, Duchess of Guermantes in Marcel Proust’s epic work, In Search of Lost Time. A pioneering fund-raiser, the countess was a major supporter of the Ballets Russes and her exceptional haute-couture collection included dresses signed Fortuny, Lanvin, Poiret, and Worth. Since 2002, Cotta has been responsible for contemporary creation at Musée Galliéra, the foremost museum of fashion in Paris. Royalty, courtiers and guests at the British court have always worn the best clothing money could buy. This illustrated talk by Historic Royal Palaces Senior Curator Deirdre Murphy will explore how opulent materials, intricate embellishments, extreme silhouettes and exclusive, custom-made garments have distinguished the court from everyone else for centuries. Many generations have used royal and court dress as a powerful communication tool. The perpetual tension between tradition and modernity have worked to add gravitas to grand ceremonial spectacles played out on the world’s stage. Examples of royal portraiture and surviving garmnets in the Royal Ceremonial Dress Collection will demonstrate how courtiers and individuals from the 10th century onward used clothes to communicate power, wealth, status, national identity and empathy with others. As curator at Historic Royal Palaces, Deirdre Murphy has special responsibility for the Royal Ceremonial Dress Collection and for curating exhibitions and displays at Kensington Palace. Attention Students: The FRCC is seeking new members of all departments to assist operations at the F R C. E-mail Maria Beniaris (mbeniaris@saic.edu) to apply. The Masters of Design: Fashion, Body & Garment students from the Professional Practices course have styled a new exhibition regarding surface manipulation and material texture using garments from the F R C Wardrobe, on view now in the Fashion Department exhibition case. Several garments including this piece by Comme Des Garçons have returned from their long journey to ModeMuseum Provincie Antwerpen for the Game Changersexhibition. MoMu is the fashion museum of the Province of Antwerp, Belgium. Founded on 21 September 2002, the museum collects, conserves, studies and exhibit Belgian fashion. Stop by the Wardrobe to get reacquainted with this iconic piece by the influential Japanese designer and more. Recent acquisitons to the Wardrobe include two exquisite pieces by Sacai (left) and Simone Rocha (right). These recent 2016 garments are currently displayed in the Study Room. To see more of the Simone Rocha SS16 collection, click here. Copyright © 2015 Fashion Resource Center, All rights reserved. The Fashion Resource Center is located at 36 S. Wabash, 7th floor room 735. Do you love furniture and interior design? This might be your lucky day! Rafael Pasitano owns an upholstery business in Westmont and is looking for someone to work for him. He will train. Call him today! www.cod.edu/academics/field/studyabroad/scholarships.aspx . Students can be awarded up to $1500 to help fund study abroad! The deadline for Spring 2017 scholarships is Thursday, October 20, 2016.